All the episodes from the third season of the animation set in the 'Star Wars' universe between the events of 'Revenge of the Sith' (2005) and 'A New Hope' (1977). 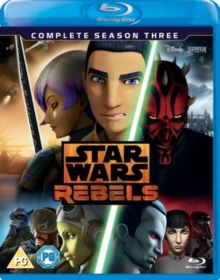 With the rebellion against the empire in its infancy, the story follows Ezra (voice of Taylor Gray), a young orphan who finds himself caught up in the adventures of the fledgling rebels. The episodes are: 'Steps Into Shadow', 'The Holocrons of Fate', 'The Antilles Extraction', 'Hera's Heroes', 'The Last Battle', 'Imperial Supercommandos', 'Iron Squadron', 'The Wynkahthu Job', 'An Inside Man', 'Visions and Voices', 'Ghosts of Geonosis: Part 1', 'Ghosts of Geonosis: Part 2', 'Warhead', 'Trials of the Darksaber', 'Legacy of Mandalore', 'Through Imperial Eyes', 'Secret Cargo', 'Double Agent Droid', 'Twin Suns', 'Zero Hour: Part 1' and 'Zero Hour: Part 2'.